Serve this dish for brunch or save it for a Sunday dinner. You’ll love the crispy potatoes along with the flavors and colors of the scramble. Do you love breakfast for dinner like I do? 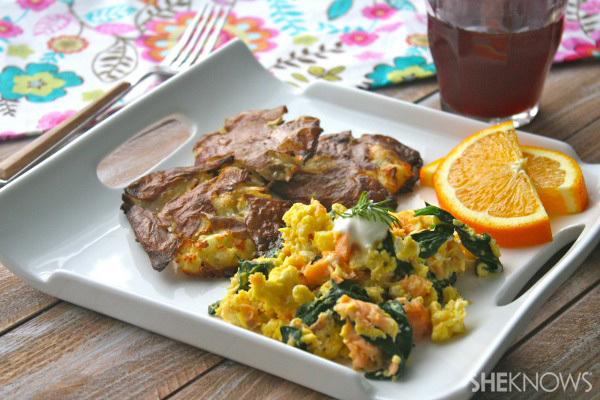 This Sunday dinner recipe for smoked salmon and spinach scramble with smashed potatoes works well early in the day or as a tasty dish to serve for dinner. I tossed spinach into the mix to bring the scramble some color and flavor that works well with the smoked salmon. The smashed potatoes are a fun way to serve your spuds, and they also bring a little crispiness to the plate! I topped off the scramble with creme fraiche, but sour cream works well, too. Whenever you serve this, it is an easy meal to put together! Add the potatoes to a large pot with water. Make sure the water covers them by about an inch. Preheat your oven to 450 degrees F. Line a baking sheet with aluminum foil and set it aside. Bring the potatoes to a boil, reduce the heat slightly and cook until they are tender, approximately 15 minutes. Drain the potatoes. Lay a kitchen towel flat on a counter and cover it with a layer of paper towel. Place each potato on the towel. Use another clean kitchen towel to place over the potatoes, and, one at a time, use the palm of your hand to press down on the warm potatoes to flatten them. Sprinkle the potatoes with the salt and pepper. Transfer to the baking sheet and drizzle the tops and bottoms with the olive oil. Bake for 25-35 minutes, carefully flipping them halfway through baking. The potatoes are done when they are crispy and lightly browned around the edges. Allow them to cool on the pan slightly, and use a spatula to remove them from the pan. Prepare the eggs 5-7 minutes before the potatoes are finished baking. Add the eggs and heavy cream to a bowl and whisk to combine. Season with the salt and pepper. Add the butter to a nonstick skillet over medium heat. When hot, add the spinach leaves to the skillet and cook, stirring, just until wilted, or about 30 seconds. Pour the egg mixture into the skillet. Use a rubber spatula to gently scrape the egg from the sides of the skillet to the middle. Break up the egg a bit so it mixes with the spinach. Cook until set, or for about 3-4 minutes. Just before finished cooking, add the chunks of salmon to the skillet and carefully mix in with the eggs and spinach. Cook just a minute or so, or until the salmon is warmed. Remove from the heat and serve on individual plates along with the smashed potatoes. Top the eggs with the creme fraiche and fresh dill, if using. Serve up a special scramble!